With the recent record rainfall and high water table many people are finding water creeping into their basements. This can lead to water damage to carpet and wood floors not to mention the risk of mold developing after wet or damp conditions. 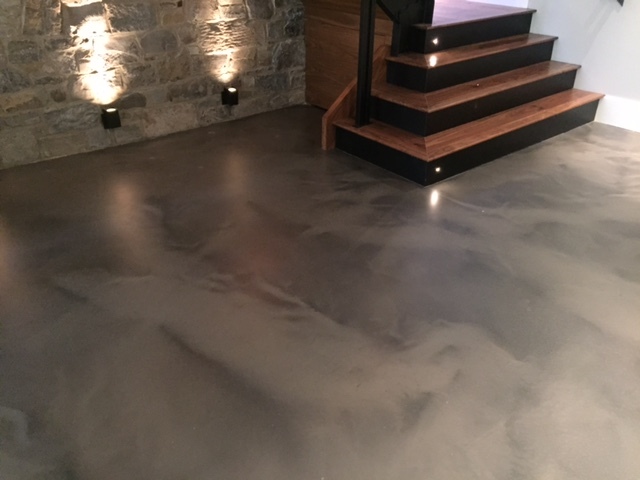 If your repairing your basement floor after recent storms consider a concrete solution. A concrete overlay is a great alternative to carpet or hardwood! It is far more resilient to water, does not promote bacterial growth, and is a much more eco-friendly solution should another flood happen. Hardscapes has all the equipment and expertise needed to remove old paint, thin-set, glue or whatever is on your floor to prepare it for a beautiful concrete finish. An Elite Crete overlay can be engraved and stained to mirror any flooring style and colour.